Tour runs: Saturday and one other day of the week. Please check the booking calendar for available dates. The original and best known of the area's falls, the tour starts with a moderate hike of around 60 minutes that leads up to the top where the real fun begins as you jump, slide and swim your way back down to base camp, emerging with a silly grin on your face and memories to cherish! The tour includes jumps of up to 8m/25ft but don't worry, the big ones have walk-arounds if you don't want to jump. 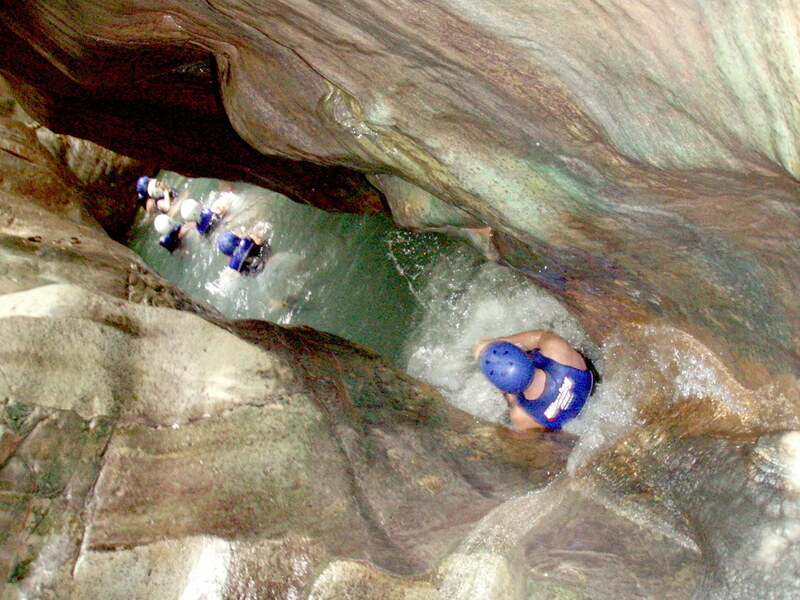 When we've finished the activity at the falls you'll change clothes, have a delicious Dominican lunch buffet (vegetarian friendly) get back on the transport and head to the tropical country zip lines! A bottle of fresh drinking water will be attached to your harness, to make sure you stay well hydrated during the activity. After the safety briefing, it's time to feel the adrenaline on the HANDS FREE 8 ACCT CERTIFIED ZIP LINES, with a total of more than 7,900 feet of double, galvanized aircraft steel cable. The longest ride is 2,460 feet. No experience is required. Unlike many zip line parks, here, you are not involved in any active braking. The guides do the work and you enjoy the ride. After zipping, relax for while by the pool or jump in and take the short zip with drop into the pool. Finally, a quick walk through the botanical garden. Local rum drinks served on the way back to the hotel. Important note: The name 27 "Waterfalls" is actually a mistranslation of the Spanish word "Charcos" that means pools not waterfalls, there are in fact only a total of 12 actual waterfalls even on the full trip to number 27. Included: Water, all equipment and safety gear, experienced guide(s) plus an authentic ﻿Dominican buffet lunch and local rum drinks on the way back to your hotel. Rated: Beginner. With reasonable fitness. Previous experience is not necessary. Minimum age 8. Swimmers only. You need to bring tennis or river shoes, swimwear, a towel and a change of clothes and shoes. Female guests are advised to wear a swimsuit with a pair of shorts over the top, this helps avoid scrapes and bumps from the water slides at the waterfalls. Pregnant women and participants with heart issues, back, neck or knee problems or those with walking disabilities may not take this tour. Slightly challenging hike at the falls and a moderate amount of walking at the zip lines. Tour pick up/drop off times are approximate depending on number of participants, quick hotel pick ups, and fitness levels. Please note * indicates that a transport supplement applies, details of prices at the bottom of the page. Tours may not include transport costs from your location. See below for details. Any extra transport costs are payable in cash on the day of your tour.